Depot Digs | News and Features | Style Weekly - Richmond, VA local news, arts, and events. Workers are digging up fuel tanks the old GRTC Transit depot. After two and a half years of studies and red tape, cleanup of GRTC Transit System's former headquarters and bus depot off Cary Street has begun. Developers long have eyed the 6.8 acres for mixed-use retail and residential development just east of Carytown. Its proximity to the Fan and the Downtown Expressway makes it one of the most desirable, undeveloped locations in the city. But standing in the way are an estimated 40,000 gallons of underground pollutants that have built up through the years. Before developers can build on the property, the contaminants must be removed, a process that GRTC estimates will take about four years. The site served as a public transit depot from the 1880s until January 2010 when GRTC moved its headquarters and bus operations to Belt Boulevard, near Southside Plaza. In that time, thousands of gallons of hydraulic fluid and motor oil leaked into the ground, mixing with water and soil to create a well-defined layer of pollution. In many ways the pollution is the best of all possible kinds, says Stephen McNally, GRTC's project administrator, construction manager and director of engineering. After conducting extensive soil sampling, it was determined that the pollution was confined to the depot and had "no unacceptable" risk of harming human health. "That is very positive news," he says, "but we still have to remove it from the property." To do so, GRTC will use a "manual bailing system," essentially pumping the pollution out of the ground. It's less costly than other methods and reduces the possibility of damaging the site's eight historic buildings, McNally says. But it's time consuming. Plans to clean up the property were approved to meet Environmental Protection Agency standards by the Virginia Department of Environmental Quality. Earlier this year GRTC put the cleanup work out for public bid. McNally says the plan is to hire a contractor this fall, possibly by mid-September. McNally estimates the cleanup will cost around $600,000 to $700,000. But before the pollutants can be removed, GRTC first must take out a number of hydraulic lifts and empty fuel tanks both above and below ground. 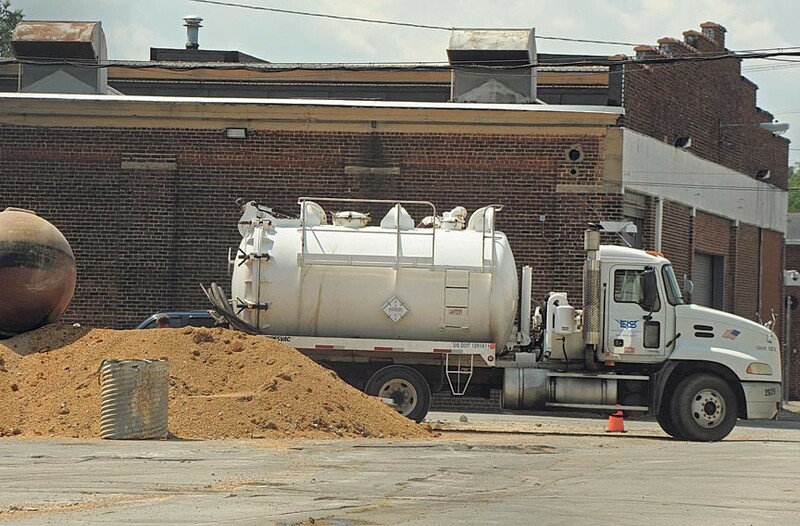 Work to remove the tanks began earlier this month, and will cost $363,000, with part of those costs being reimbursed through funds from the state environmental department. McNally estimates the first phase will be completed during or before November, and says the delay caused by the cleanup shouldn't lead to any missed development opportunities. "Let's face it, there's not a whole lot of economic opportunity or development that's occurring in Richmond right now," McNally says. "While we're waiting for the market to turn around, this is actually a good time to be carrying out this process." In 2009, GRTC agreed to sell the property to the Richmond Redevelopment and Housing Authority for $5.4 million. But that was before the environmental problems — and the time it would take to clean up the mess — were fully understood. The $2.1 million that Mayor Dwight Jones set aside toward the purchase of the property in 2010 has been reallocated to the general fund.